read these roads. Kai Lossgott. Video installation. read these roads. Kai Lossgott. 2009 – 2010. Single channel SD DV PAL, stereo. 03 min 59 sec. 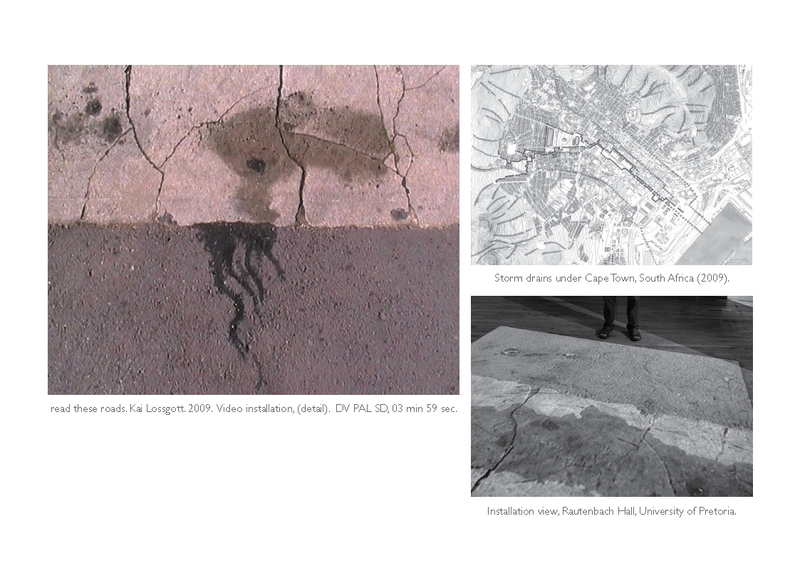 The evaporating water animations hint at the living systemic relationship between Table Mountain’s hydrology systems, the City of Cape Town’s water system and the biological systems of the human body. This is a video poem of unfulfilled desire for a personal bond with the natural world. The soundtrack of the video is taken from Adderley Street in the Cape Town CBD, above the underground storm water drain where the now forgotten Varsterivier, among others, (3 million cubic tons of untapped fresh spring water) runs into the sea daily. Fresh water is one of South Africa’s scarcest resources. This project draws on the original research by interdisciplinary South African water heritage scholar Caron von Zeil (Reclaim Camissa). 2012 SFIP (Still Fighting Ignorance and Intellectual Perfidy) – African Video Art curated by Kisito Assangni. National Centre for Contemporary Arts, Moscow, Russia. Pori Art Museum, Pori, Finland. Torrance Art Museum, Torrance, California, USA. Lucca Centre for Contemporary Art, Lucca, Italy. Arena 1 Gallery, Los Angeles, USA. AIVA Festival, Angelholm, Sweden. 2013 SFIP (Still Fighting Ignorance and Intellectual Perfidy) – African Video Art curated by Kisito Assangni. Videoformes, Clermont-Ferrand, France. Malmo Konsthall, Sweden. Motorenhalle Centre for Contemporary Art, Dresden, Germany. Kunsthalle Sao Paulo, Brazil. Next Post → nothing with skin is blind. Kai Lossgott. Plant leaf engravings, installation, light, sound, video, photography.